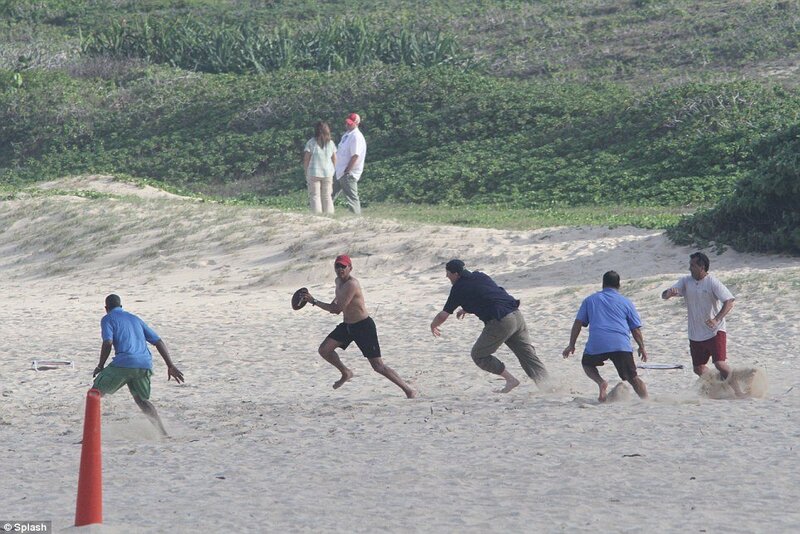 President Barack Obama stripped off for some beach football to round off his Christmas holidays in Hawaii. While his Republican rivals were deep in preparation for the Iowa caucuses, the pictures show President Barack Obama had his mind on diving headlong for catches and tossing touchdowns to his friends from the Secret Service. Barack Obama, 50, looked surprisingly lean on New Year’s Day at the Kaneohe Marine Corps Base on Oahu, where he stayed with the first family for their 10-day vacation. The football game brought to an end a relaxing and fun-filled 10 days for Barack Obama, who arrived in Hawaii a week later than he had hoped. He would have enjoyed an even longer period away from the White House had there not been a stalemate in Washington D.C. over the payroll tax cut. Barack Obama certainly made up for lost time as, within an hour of arriving on December 23, he took wife Michelle out for dinner at one of their favorite hotspots, Morimoto Restaurant. Then, on Christmas Eve, they spent some family time together with daughters Sasha and Malia in the morning. During the afternoon the couple split their time as President Barack Obama went to play golf and the First Lady answered phone calls from expectant children who called NORAD to see where Santa was on his route. Like many families, the Obamas spent Christmas morning by themselves, opening presents and singing carols. They then attended church services at a nearby naval base and talked with military families afterwards. President Barack Obama had no public schedule when he arrived in Hawaii but his schedule seemed to fill up quite quickly. The entire Obama family was joined by their friends, the Nesbitts, as they took a drive from their multi-million dollar rented vacation home to the Sea Life Park marine sanctuary. While there, the girls were able to release three 18-month-old sea turtles into the wild. Though Barack Obama tried to keep a low profile throughout the trip, he and his motorcade were seen driving to and from the golf course a number of times. One of his golfing partners was an old high school buddy Robert “Bobby” Titcomb, who was arrested in a prostitution sting. After golf that day, the boys were joined by the First Lady and President Obama’s sister Maya Soetoro-Ng at Alan Wong’s, one of Hawaii’s priciest restaurants. In an act of reflection, Barack and Michelle Obama visited the Pearl Harbor memorial and paid tribute to the thousands who lost their lives there 70 years ago. It was his first visit since 2008, when he was president-elect. And then on New Year’s Day, Obama family went back to their roots by paying tribute to two different generations. They first visited the grave of Barack Obama’s maternal grandmother, Stanley Durham, and later they went to an exhibit honoring his mother, Ann Durham, and the work she did overseas in Indonesia. It was afterwards that Barack Obama managed to squeeze in a game of football – the photographs of which some have compared to Vladimir Putin’s display of masculinity in promotional pictures. Vladimir Putin is well known for posing with his top off in a bid to demonstrate his power and virility. Later that night, the Obamas left the girls at home while they joined 10 friends for dinner in the private room at celebrity hotspot Nobu Wakiki. They returned to Washington D.C. on Monday, January 2. Bufferin, Excedrin, NoDoz, Gas-X Recalled. When will they be back?